Aaron Tshibola in action against Wycombe Wanderers. 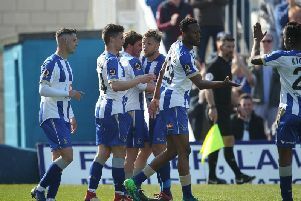 NEW signing Aaron Tshibola insists he didn’t think twice about joining strugglers Hartlepool United who are now 10 points adrift of safety, writes RICHARD MENNEAR. The powerful 20-year-old was boss Ronnie Moore’s first signing since taking over as Pools manager, the Reading youngster joining on a month-long loan deal. He only trained once on Friday afternoon with his new team-mates but was thrown straight into the line-up for Saturday’s 1-0 defeat at Wycombe Wanderers. Tshibola impressed on his debut alongside fellow loanees Scott Harrison and Rakish Bingham and he admits he enjoyed his role in the team. “As soon as I heard about the chance to come here, I thought yeah why not,” said Tshibola. “It is a big club with a big history and they should be higher up in the table. “It is a big job, of course, but it is something that I am relishing. “I only joined the team on Friday afternoon for training and then to go straight into playing was great. “It was quite challenging circumstances [joining the team so late] but that is part of football and life. With Moore opting for a flexible 4-5-1 formation, or 4-3-3 when Pools were in possession, Tshibola saw plenty of the ball and also blazed a couple of efforts wide. debut, it was good to get out and play,” he added. “It was a lot different to playing reserve football but I thought we did well and worked hard. “It isn’t easy to come here and play the way we did. Pools almost came away with a point, Bingham hitting the left-hand post with a close-range header in the 89th minute. Tshibola added: “We could have nicked a point at the end and we would have been buzzing with a draw. “You have to stay in games and for a young defence I thought we hung in there well. “If we had nicked it I would have backed us to go on and win the game. “I found myself in a couple of good positions myself and snatched at a few with my left foot – not my strongest foot. Athletic Tshibola has already played in the Championship for the Royals this season and his Pools debut was watched by several of the Reading first team squad at Adams Park, including Anton Ferdinand. He added: “The Reading lads told me they were coming to watch me.